As Jam begins to write in her journal, she’s transported to a place where Reeve still lives, and they can be together. A place she calls Belzhar. As the semester winds down, and the pages of Jam’s journal fill, she knows her visits with Reeve can’t last forever, and the end of them will be like losing him all over again. But she can’t run from the truth forever. And this time, as she faces her beloved Reeve, she has to face truths about him and about herself before she can find healing. I’m pretty sure I read about this book on a list of a blogger’s favorite books or something of that nature. I think at that point, I had recently read the Bell Jar, and I was even more curious about the story because it references Plath’s work. Since then, it’s been on my to-read list, and at last, I’ve finally read it. Honestly, I was a little disappointed. There were definitely things I liked about the story – I loved the teacher and the other classmates in the Special Topics class, even if I felt like they deserved a little more airtime. Besides the span in which they told their own stories, I didn’t really feel like I got to know them very well. Which is okay – it really wasn’t the point of the story. There’s a big twist that I won’t give away, but I had really mixed feelings about it. On the one hand I was really surprised when the truth was revealed. I didn’t suspect it, and yet when I evaluated earlier scenes in the story, it changed how I perceived them, which I think is a mark of a great plot twist. So that was impressive. On the other hand, I felt like it kind of cheapened the story in a way. I’m not sure I really bought into the real story having the kind of weight I felt like it needed to have. I felt like it kind of took this big conflict and deflated it a little bit. On the other-other hand, I think the way it played out also felt like a tribute to the way emotional trauma can be devastating and powerful. So I don’t want to downplay it too much. There was also one moment in which a big thing happens, and Jam isn’t there. I really wanted her to be there for this one critical moment, and instead she hears about it third-hand. So that was a bit disappointing. On the whole, I’m glad I read it, but it didn’t resonate with me the way some of my other recent reads have. If you’re looking for something that’s a much lighter version of Girl, Interrupted (I’m thinking the movie with Winona Ryder), then this is probably something you want to check out. Extreme profanity used with moderate frequency. One character in particular has a bit of a foul mouth, but the language is kind of sprinkled throughout the story. There’s some kissing between Jam and a boyfriend. They reach under each other’s shirts and touch each other. At one point they remove shirts and lie next to each other. Through writing in a journal, Jam is transported to a place she calls Belzhar. There, Reeve is alive, and they are together. The place has rules – she can only relive past moments, nothing new, and after a period of time, she’ll be booted back to reality. Brief mentions of a drunk driving accident which leaves a girl paralyzed, a boy who has been kidnapped, and a devastating fire. Jam recalls going to a party at which several teens drink alcohol. Several mentions of smoking pot. 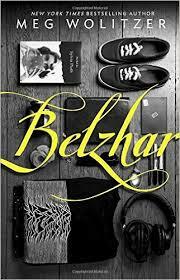 Tagged Belzhar, Dutton Books for Young Readers, grief, Meg Wolitzer, Therapy. Bookmark the permalink.